OMEGA’s LCM900 Series bolt force sensor is a compression load cell designed to measure the clamping force of a bolt. With excellent long term stability and all stainless steel construction, the LCM900 Series delivers high reliability in severe industrial environments. 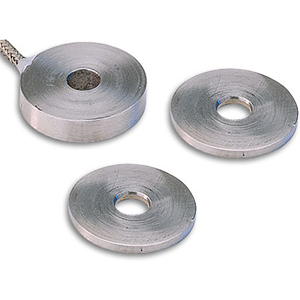 This unit is designed to operate by mounting on a flat surface between two mounting washers (included). The LCM901 is also available in standard configurations, with 0-2,000 to 0-100,000 lb ranges. Please see the LC901 for complete details, or contact our Pressure department for more information..